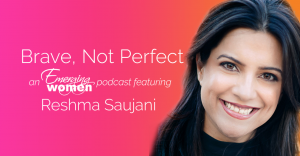 If you don’t know the name Reshma Saujani, you do now. Her mission is to change the culture through her program “Girls Who Code.” In her 2016 Ted Talk, she gets to the heart of the matter. In the 12 minute video she explains the ability to be brave in the face of adversity by giving a personal story and how it shaped her life. But she waited until she was 33 years old to find her brave self. Her resume reads long and accomplished since then. Reshma goes on to give examples of when girls “self talk” takes shape, around age 10, and other examples later on in their lives of how they react to their own struggles and abilities. I don’t know when I found my “brave self,” but I believe it came in stages as life showed up and made me make hard choices. I do know it would have served me much better to know my own strength of character sooner. This post is an example of why I now promote strong women and hope, to help change the culture. 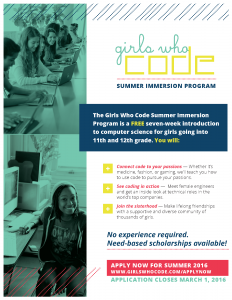 The link to “Girls Who Code” shows the clubs, campus programs and summer immersion programs all over the country and Puerto Rico. It also gives information on how to get involved. This is where our education system fails many. There are different learning styles that are not being encouraged. To be a teacher nowadays, requires to be able recognize this and provide the appropriate learning tools. Not a “one size fits all” for sure. And I am seeing many ways in which this is changing. Watching “One Strange Rock” interviews with the female astronauts shows that the culture is shifting. They found their passions watching the moon landing and found the way to make it happen in engineering and science fields. Looking at all the women doctors, dentists, lawyers and CEOs shows the shift. These are the brave faces that young girls can now aspire to. 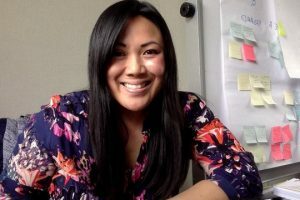 Meet Jennifer Gaspar-Santos, the Director of Educational Technology and Innovation at St.Ignatius College Prep in San Francisco, CA. She’s also a mother, a Filipina and a lover of curiosity. When I started Girls Who Code, I never would have imagined that we would grow to become a movement reaching almost 90,000 girls of all backgrounds in all 50 states. And now, just six years into our work, we’ve reached a tipping point. 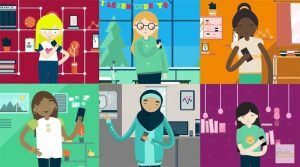 We are on track to achieve gender parity in computer science by 2027. And we know why: because our work is as much about quantity, as it is about quality. We scale our programs to reach more girls in more places, and give them the chance to forge lifelong bonds so they may persist in computer science. It’s incredible. But for us, parity is really just the beginning. We’ve reached a moment unmatched in our history, a moment as full of anger and anguish as it is promise and potential. Women and girls across the country are coming together to correct centuries-long power imbalances across lines of gender, race, sexuality, and more. Girls Who Code is proud to be a part of this movement, and even prouder because our girls – girls of all races and ethnicities and abilities and zip codes – are leading it. They are solving problems in their communities, empowering their friends, and defining the future of our world. We’re thrilled to be giving them the tools they need to get there. I hope you’ll join us and make sure every girl has the chance to change her world – our world – for the better. Thank you for your support.